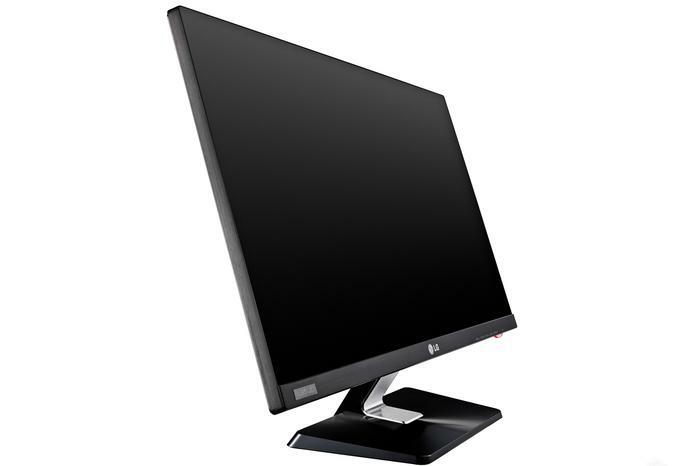 LG’s IPS7L monitor brings excellent colour and good viewing angles to the mid-priced large monitor market. For a reasonably priced monitor it looks great, if you don’t mind the 1080p resolution -- better for budget gamers, but not as detailed as a 1440p screen. If you’re looking to buy a new monitor these days, you’d be mad not to purchase one that’s at least 24 inches in size. What used to be an unreasonably large LCD monitor is now mainstream, and 27-inch screens are now surprisingly affordable. 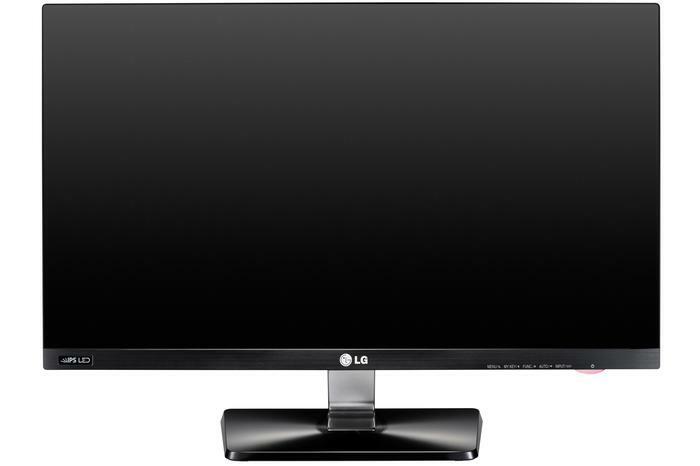 LG’s IPS7 monitors come in both 23-inch and 27-inch sizes; today, we’re looking at the 27-inch IPS277L. It’s an IPS panel with a 1920x1080 resolution. LG’s IPS7 monitor mimics its mid-range Cinema 3D LED TVs like the LM7600. The IPS7 has a single-point stand unlike the LM7600’s dual-point, but when it comes to the screen itself it’s near-identical. LG uses a single sheet of glass across the screen’s front, stretching from edge to edge, so there’s no bezel as such. It’s important to note that the 27-inch LCD panel itself doesn’t stretch from edge to edge, as some outdated marketing pictures show — there’s a bezel of around 9mm on each edge of the panel. The design is, like LG’s TVs, simple, stylish, and elegant. The lower screen bezel is around twice the thickness of the top and sides, with a dark brushed aluminium-effect strip that has the LG logo and a few touch-sensitive buttons for power, menu navigation, and input switching. 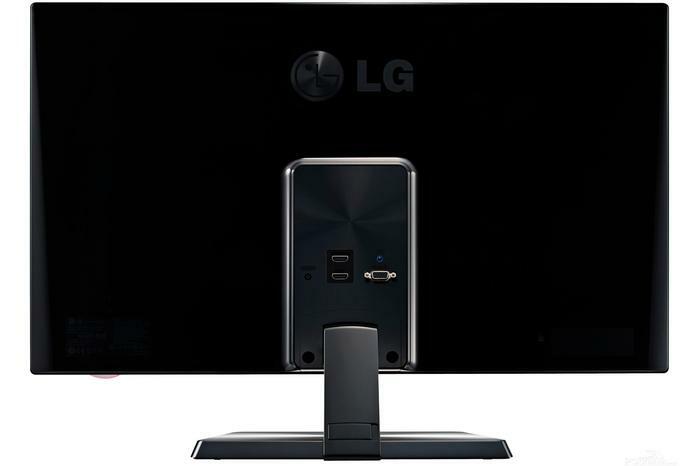 The LG IPS7 has a very simple back panel — along with the LG logo and glossy plastic casing, the monitor has a 12V power plug, two HDMI ports, a VGA port and a headphone-out socket. There’s no DVI — and it’s not really needed, since at 1080p, a dual-link DVI port isn’t necessary like on higher-resolution 1440p monitors. One of the HDMI ports is compatible with MHL, letting you hook a mobile device like a smartphone up to the IPS7 monitor, and use it for displaying video while also charging it. Both HDMI ports support audio, but the monitor doesn’t have any speakers — HDMI audio is output through the 3.5mm headphone jack on the monitor’s rear. We wish the headphone port had been placed in a more easily-accessible location like the lower bezel near the power button. Assembling the monitor is very simple — the base of the stand clips to the vertical stem with a single screw, while the assembled stand attaches to the panel with two screws. There’s no VESA-compatible mounting holes on the back of the monitor, so there’s no chance of putting the IPS7 on a wall mount without serious work. The stand tilts backward over around twenty degrees of motion, but there’s no swivel, no height adjustment and no rotation to portrait mode. It’s a sturdy stand, just not a particularly versatile one. Before we go any further, we need to reiterate that the LG IPS7 isn’t a ‘borderless’ monitor in the same way that some marketing images you might have seen show — the 27-inch panel stops around 9mm from the top, left, and right edges of the monitor’s chassis. The 27-inch, 1920x1080 screen is, in a word, excellent. Straight out of the box it’s set up for bright backlighting and contrast colours, but with a tiny bit of tweaking it’s able to display great levels of detail and impressive performance. As a 1080p panel, the 27-inch IPS277L won’t be able to display as much detail during a modern game as a 27-inch 2560x1440 (1440p) monitor will be able to. There’s an up-side to this in that driving a game to acceptable performance at 1080p requires a lot less graphics and processing power than at 1440p — so for budget-conscious, mid-range gamers, buying a 27-inch 1080p monitor makes a lot more sense than a 1440p one. The backlight is appreciably bright at its maximum 250 nits brightness — more than enough for use in a bright day-lit office like the one we tested in. Backlight consistency is excellent — just like the Samsung SA850T we used as a benchmark, there’s no obvious backlight bloom or torchlighting even at maximum brightness on a black screen. This is the holy grail for an LED edge-lit LCD monitor, since it means much better representation of black areas of the screen without any cloudiness. Before calibration, screen contrast was good, but there was a very little amount of detail lost in extra-dark and extra-bright areas of the screen. Calibration only meant backing off screen contrast settings slightly, so it’s a minor trade-off between having punchy images or seeing all the detail that’s possible — we always opt for the latter, but gamers may enjoy the former. What’s interesting is that LG’s included comprehensive options for both manual and automatic hardware calibration. If you’ve got a supported display colorimeter like a Datacolor Spyder3, you can install LG’s True Colour Finder software and have the display calibrate itself automatically in around five minutes (as long as you’re using HDMI). If you have an unsupported colorimeter, LG’s got hue and saturation sliders for six-colour adjustment — a great standard for calibration that we’ve seen on the company’s high-end LED TVs. The anti-glare coating included on the IPS7 is good. Again, like the Samsung, it cuts out a great deal of reflection without making the image look grainy or pixelated or stealing appreciable detail or contrast. We love a screen with a good satin anti-glare coating, and the LG IPS7 is just that — it looks great off as well as on. Being an IPS panel, we were confident that the LG IPS7 would have excellent viewing angles, and this is thankfully true — accurate colour and lighting is maintained across a wide angle both vertically and horizontally, with a moderate and slow roll-off in accuracy and brightness as you move outside the roughly-90-degree horizontal and 60-degree vertical arc of ideal viewing. Our gripes with the LG IPS7 monitor are purely confined to its design — the mediocre stand, and the lack of VESA mounting. When it comes to actually using the monitor, we liked almost everything about the IPS7’s image, panel and performance.